Launched in late 2004, the CLS was Mercedes Benz’s first attempt at combining the ‘sleekness’ of a coupé with the practicality of a saloon. Based on the W211 E-Class, the CLS was positioned as a niche, upmarket alternative, with the initial press release contending the CLS500 variant offered S-Class levels of comfort with available air suspension and four-zone climate control air-conditioning. The primary purpose of the CLS was to cater to a market looking for the apparent sportiness of a coupé whilst retaining the practicality of a sedan. However, a focus on comfort and luxury over outright space was evidenced by a four (rather than five) seat configuration, with the central rear seat replaced by a flowing rear console flanked by two wide outboard seats. Market wise, the CLS successfully carved out its own niche, later spawning direct competitors such as the Audi A7 and the BMW 6 Series Gran Coupe. A critical aspect of the CLS' side profile, and indeed the overall design, is the presence of a bone line. A bone line can be a key aspect of a car’s side profile, serving to add visual interest or to emphasise the character of a car, often by acting as a sight line to guide the viewer’s eye. The bone line has been an element of automotive design since the mid-20th century. The Ford Thunderbird was one of the first examples of a bone line being used to accentuate the side profile of a vehicle. 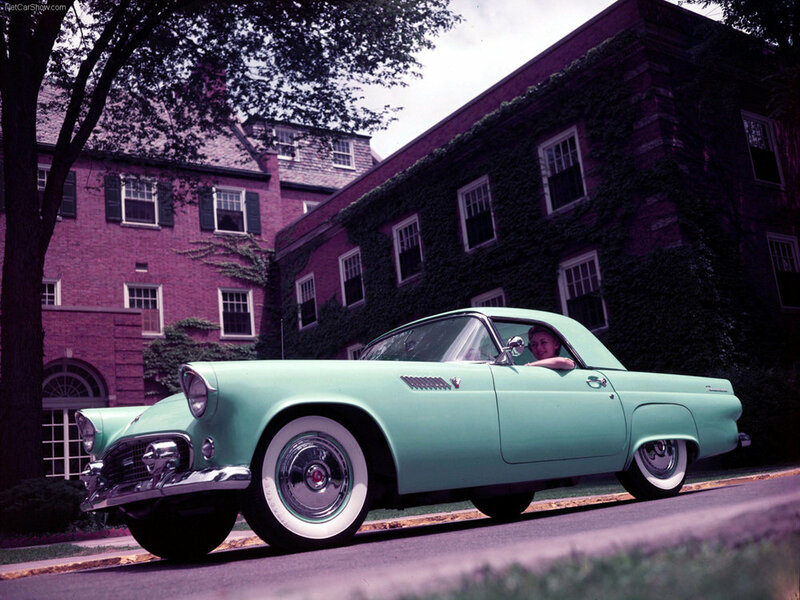 Above: The 1955 Ford Thunderbird. The bone line stretches right from the rear tail-lamp to the edge of the front wheel well. In this case, the bone line accentuates the side scuttles and helps differentiate the upper tail-lamp ‘fins’ from the rest of the tail end. 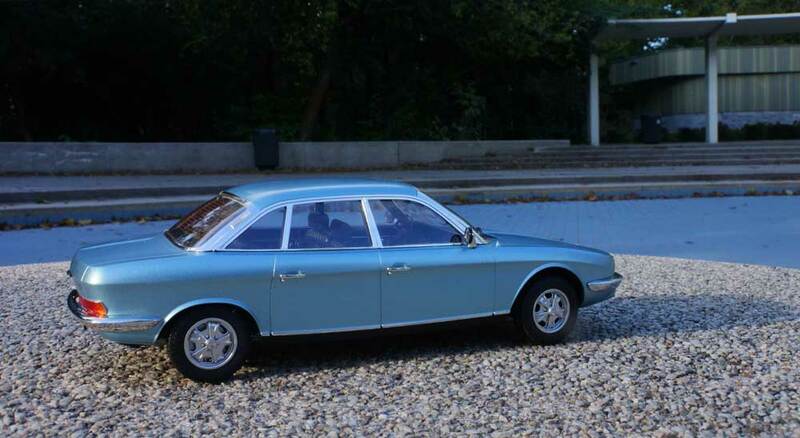 Above: The 1967 NSU Ro80 interestingly implemented a continuous bone line which wrapped around the tail of the car. In this instance, the bone line was an effective device to highlight the unadorned, aerodynamic styling of the sedan. The clean styling also served to create a contrast with the innovative Wankel powertrain lurking underneath. 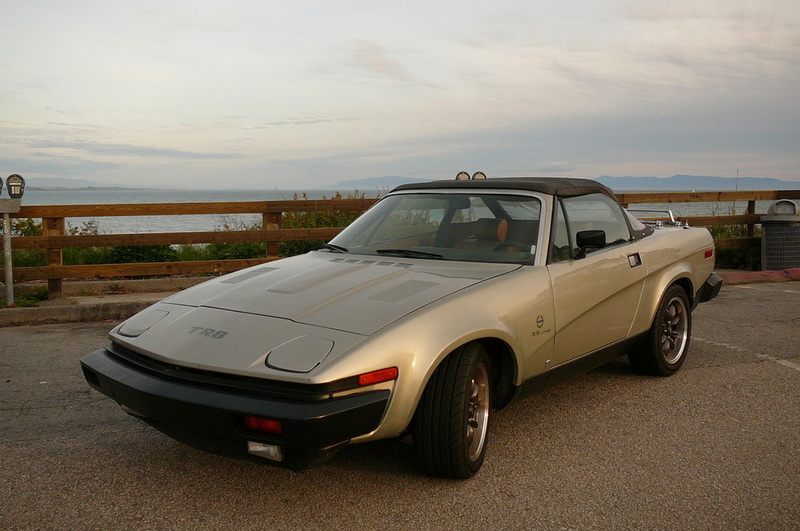 Above: The 1975 Triumph TR7 presented perhaps one of the most radical examples of a bone line in its time. The dramatic upward sweep bisected the side profile and served to add an ostensibly sporting character to an otherwise underwhelming convertible. From top to bottom: The 2012 Hyundai Accent and the 2015 Subaru Liberty (Legacy). Expressive styling features such as the bone line are no longer restricted to the domain of prestige or sports cars. The Subaru Liberty, for example, implements a bone line to break up an otherwise slab-sided side profile. The Hyundai Accent, meanwhile, uses its striking bone line to visually lengthen the car, creating an image of spaciousness despite its small size. Over the course of automotive history, the bone line has proven itself to be a versatile automotive design feature. As described above, it has been used to highlight singular features of a vehicle's styling, such as the tail fins on the Ford Thunderbird, or to develop the overall design of the car, as with the NSU Ro80. As per the case of vehicles such as the Hyundai Accent, it can also serve as an effective design feature to highlight qualities of the car's interior, such as spaciousness. The distinguishing achievement of the design of the CLS, however, is its use of a bone line, in conjunction with other design aspects, to deftly blend sport and luxury. The bone line serves to enhance the sportiness of the CLS by developing the vehicle's coupé like side profile. In this case, the bone line arcs slightly as it stretches from the front wheels to the edge of the rear tail-lamp. The visual impact of the bone line in the CLS is especially evident from the rear three-quarters view. Here, the bone line highlights the sharply sloping cut of the rear window line in order to develop a coupé like side profile. The car features several secondary design elements which also serve to assist the bone line in its function of creating a coupe like profile. Importantly, the teardrop shaped headlamps act as a visual ‘starting point’ at the front of the car, leading the observer’s eyes backwards towards the low roofline whilst also directing them around towards the bone line. Another aspect of the design of the CLS which highlights its coupe profile is the stout, almost ‘duck-billed’ tail-end. By giving the boot a narrow aperture and extruding the rear bumper so that the tail effectively curves outwards, the back of the car creates a sharp, almost ‘cut-off’ look. This complements the character given by the bone line stretching across the sides of the vehicle, and in turn completes the coupé look of the CLS. Importantly, apart from developing a coupè profile, the bone line in the CLS serves a dual function of creating a luxurious, almost stately appearance. In this instance, the CLS’ bone line emphasises the length of the car and imparts an impression of solidity. To explain how the CLS does this, let's first examine how other cars with a sole luxury focus have utilised the bone line. The 2008 Jaguar XJ (above) and the 2015 Rolls-Royce Ghost Series II (below) are both ‘traditional’ luxury sedans that incorporate a prominent bone line to highlight the length of the car. In the case of the Rolls-Royce, the placement of the bone line just below the door, and the thick C-pillar together with the absence of any further visual ornamentation, actually helps to create an almost vault-like impression of solidity. The CLS uses its bone line to develop a similar effect. In a fashion similar to the Rolls-Royce, the placement of the bone line just below the windows on the CLS combines well with the wide, flowing C-pillar to impart an impression of solidity and accentuate the length of the car. Additionally, similarly to how the bone line highlights other design aspects that endow the car with a sporting, coupé like character, the bone line also serves to focus attention on other design aspects that make the CLS appear luxurious. One example of this is the dashboard ('dash') to axle ratio. Widely regarded as the 'prestige proportion', the dash to axle ratio is the distance from the front axle to the dashboard. Historically, this ratio was an indicator of the size, and hence power, of a vehicle's engine, with luxury vehicles tending to use larger engines. Above: The 1932 Bugatti Type 41 Royale. Intended for use by monarchs and heads of state, this Bugatti was the most luxurious car of its era. The extraordinary dash to axle ratio hinted at the 12.7 litre 8 cylinder engine powering the car. Whilst obviously nowhere near the level of the Bugatti, by accentuating the length of the vehicle, the bone line draws the viewer's eye to the CLS' dash to axle ratio, effectively exaggerating its size. Unrelated to the bone line, the trim, or cosmetic modifications and embellishments, of a car can also serve to emphasise one aspect of its character. This is especially useful for a vehicle such as the CLS that is a fusion of body styles. Above from left to right: AMG and standard specification wheels, on the CLS 280 'Grand Edition' and CLS 350 CGI models. 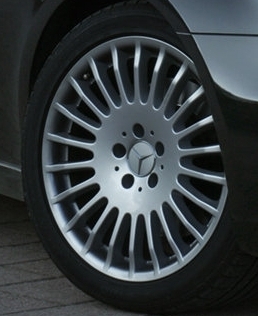 Wheel design is a key aspect of the CLS' trim. The 22 spoke wheel design on the black '350' specification, depicted above, lends a sense of elegance and refinement befitting its luxurious character. In contrast, the polished, five spoke AMG wheels give the vehicle a more aggressive personality, highlighting the car's power and sporting character. Over the last century, the bone line has evolved to play an important part in a vehicle’s exterior design, often being key to adding character and hence defining a car’s personality in conjunction with other design elements. The Mercedes-Benz CLS serves as a prime example of a contemporary vehicle that incorporates a bone line as a key part of its exterior design. In this case, the bone line combines with various other design elements to develop a melding of styles; namely that of a sporting coupé whilst also maintaining a stately, almost regal appearance of luxury.